the country. When it fishes you can have some tremendous sport. It situated where the River Ellon meets the Solway Firth, so the sea fishing is greatly influenced by the strong tides, a feature of this area. Flounder and plaice will make up the bulk of catches and can be targeted twelve months of the year, with sport peaking between March and September. As the nights start drawing in and temperatures drop, whiting and codling move inshore and night sessions will produce 20lb bags of fish. 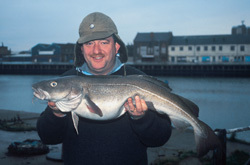 During summer, long spells of calm conditions ensure the best plaice fishing but rough weather is required to keep the codling on the beaches in winter. 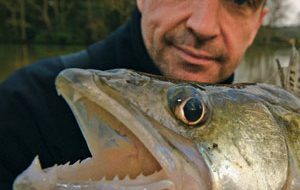 Another aspect of sea fishing in Cumbria is that there is always a possibility of a stray bass or strap conger eel taking your bait. The promenade follows the coastline north from the harbour and is a popular recreational area as well as being a brilliant fishing mark. During the warmer months of the year large numbers of plaice are landed with good fishing possible at both low water and over high tide. A recent open competition fished on the promenade produced a weigh-in of 99 plaice for the 42 competitors, which is good fishing by any standards. Flatties caught in this area will average about 1lb with specimens to 3lb and bags of up to six fish a session landed on a regular basis. This area also produces good catches of codling, whiting and coalfish during the winter, with frozen peeler crab and black lugworm the top baits. The piers on both sides of the harbour are fished mainly over the high-water period when the River Ellon, which flows through the harbour, can offer shore anglers plenty of action. The river produces good catches of flounder, freshwater eel and the occasional coalfish during spring and summer, with peeler crab the top bait. Mackerel are landed in reasonable quantities on the bigger tides when the weather is calm. During the colder months of the year, when the sea is rough, whiting and codling are landed with locally-dug blow lugworm the most successful bait. Maryport also has a superb marina with modern facilities, which cater for both local and visiting boat anglers. The beach at Glasson is highly rated as a flounder and plaice mark, especially in the early spring months when the fish are returning inshore following their breeding season. After spawning they are generally very hungry and will take most baits offered, although peeler crab will always be the favourite. In autumn and winter, codling and whiting are the main quarry with black lugworm the top bait. The north end of the beach is sheltered by Maryport south pier and can produce big bags of fish following westerly gales. The railway runs along the seafront, where car parking spots coincide with access points across the lines. Flimby Beach is better known as a winter mark when stormy nights can give excellent sport, with big bags of codling and whiting falling to lugworm baits. In past years open competitions and local club matches fished on these marks have produced catches topping 20lb. At other times of the year flounders and plaice are about in reasonable numbers with fresh peeler crab the vital ingredient for success. You can’t miss Siddick. Just look out for the wind turbines along the shoreline and the line of factories opposite. There are a number of narrow tracks leading to the railway line, where it is possible to park safely and where there are designated places to cross the line. In the spring these marks produce some outstanding plaice catches with a real possibility of fish to 3lb on lugworm or fresh peeler crab baits. At this time of the year strap conger eel are often encountered, so use heavy line – a minimum of 25lb main line at all times. From October through until the turn of the year, codling will show whenever there is a good westerly sea running. Locally-dug blow lugworms tipped off with peeler crab or white ragworm are the favourite baits. The Black Bank is one of the top fishing marks on the Cumbrian coast, with a reputation for producing good bags of fish throughout the year. In early spring and summer, plaice and flounders show in tremendous numbers and this is often the match-winning spot in local open competitions. Other species such as rockling and freshwater eel, plus occasionally a few lesser-spotted dogfish and strap conger eel, will show. In the winter months when westerly winds whip up the seas into a frenzy the area will produce some prodigious catches of codling and whiting, with bags topping the 20lb mark. The top baits throughout the year are fresh and frozen peeler crab and lugworm tipped off with Seabait ragworm or a sliver of mackerel. 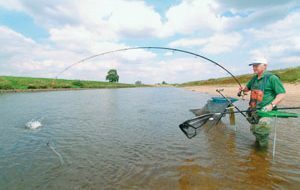 Make sure you use a minimum of 25lb main line when fishing the rougher marks – you’ll need it! When fishing for plaice, try adding a few brightly-coloured beads and sequins to your rigs, near the hooks.